Desktop digital picture frames have largely faded away, a side effect of the ubiquity of smartphones. Now the next thing to go digital is the artwork on your wall, such as the latest connected-art canvas from New York City-based Meural. The 27-inch, 1920x1080 display is large enough to be a focal point on your wall or fireplace mantle, and it taps into a collection of more than 20,000 pieces of art via an 802.11n Wi-Fi adapter and a companion Android or iOS app. Access to the collection is included in the $495 price of the frame (a "Lightbox" model sells for $595). The frame has 8GB of built-in memory, so you can store a number of works at once. Wave your hand in front of the gesture sensors built into the frame, and you can scroll through your favorite pieces. Vukicevic and his team set up partnerships with Eyes on Walls, Lomography, the New York Public Library, and others sources so that it would not be required to charge its customers additional subscription fees. Meural won't rule out adding a subscription service down the line if it helps expand the selection of artwork available, according to Vukicevic. This differs from the other digital canvas options we’ve covered: the Klio art service is $10 per month after the first year, and the Acanvas art display has a similar deal for its Kickstarter supporters. 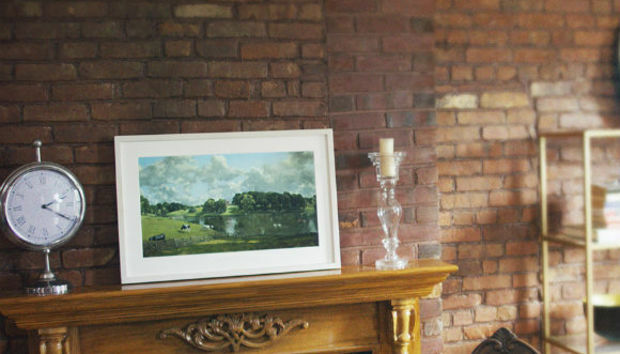 The Meural app allows you to browse for new art to display. Three frame finishes are available: a black and white frame with white inlay, and a special limited Lightbox version that features natural maple wood. The Lightbox version is also slioghtly larger: 34 x 23 x 2 inches, versus 32 x 21 x 2 inches for the standard frame. Both frames are available for purchase now from Meural's website, with a lead time of seven to 14 days. Why this matters: Where Meural really shines is the fact that there is no added expense for art. Most connected canvases are already expensive: Klio’s higher-resolution (4K) but only, slightly larger frames will set you back nearly a grand, plus $120 for every year you own it. We also like the fact that Meural added gesture capabilities to its frame to navigate through your selections. As convenient as the app might be to use, it can't beat a wave of your hand. We hope to review the Meural soon and see how well this feature works, and if the free artwork is up to snuff.